After many successful instructional DVDs — see “Jointer and Planer Secrets”, “Revelations on Table Saw Set-up & Safety”, “Working with Plywood”, “Wood Science & Design”, “Surface Preparation and Staining” and “Hand Finishing and Rubbing Out” — Hendrik decided to turn his attention to the world of bandsaws and routers, releasing two new productions in 2011. “Using and Tuning Your Bandsaw” is the second DVD newly released in 2011, but let us first hear about the long awaited router production: “Using Your Router and Router Table Safely”. “Using Your Router and Router Table Safely” takes you through everything you need to know to successfully use your router and router table, all spread over nearly 8 1/2 hours of footage on 4 discs. As is Hendrik’s usual style, this DVD set is a detailed step-by-step course – not the “usual” DVD fare that may have disappointed you in the past. The DVD starts by taking you through some of Hendrik’s favourite routers, including the features that are most important to him. Hendrik also shows you his shop-made router table and reviews the important features with enough detail to allow you to build a similar router table if you so choose. After covering router and router table features, Hendrik then takes you through his personal recommendations for router bits you may wish to add to your collection. He covers the common bits everyone should have such as straight bits, flush trim bits and rabbet bits. He reviews his favourite edge treatment bits such as round-over, cove, chamfer, fluting, beading and ogee bits. Then he goes into specialty bits such as spiral cutters, slot cutters, panel raising bits and a whole lot more. He also stresses his belief that high quality router bits give you more value and offer a greater level of safety compared to cheaply made off-brand router bits. In Hendrik’s usual methodical way, he spends six full chapters teaching you various routing skills, both with a hand-held router and then on the router table as well. Two chapters deal with routing edge treatments, as you may wish to do around the edge of a table top. He covers both long grain routing and end grain routing, constantly reinforcing important safety aspects as he goes. Two more chapters deal with the routing of rabbets, dados and grooves, as you will need for many joinery situations. For example, you might need to rout through dados or even stopped dados to join book shelves to the sides of a cabinet you are building. Rabbets might be needed to hold back panels and grooves might be needed to hold door panels in your frame-and-panel doors. These are core skills that must be learned to build any fine furniture project. Two more chapters deal specifically with plunge cuts, both by hand-held router with a plunge router, and on the router table. Plunge cuts can be a lot more dangerous than regular through cuts, but they are commonly needed when building furniture. In addition to covering the techniques themselves, Hendrik shows you jigs that allow you to get more accuracy out of your router. Sometimes it is as simple as a straight edge clamped to the workpiece to rout a groove or dado. At other times, Hendrik uses a flush trim guide or a more complex dado routing jig previously shown in an earlier production called “Working with Plywood”. Hendrik also shows you how to use a commercial edge guide that can attach to your router base, as well as template bushings. There is an entire chapter devoted to routing curved parts with a single-point fence. Hendrik explains how a regular starter pin works on a router table and will show you why an easily made single-point fence works so much better. By the end of this chapter, you will become a convert to his single-point fence method. Another full chapter focuses specifically on the often misunderstood technique of climb cutting. While fully explaining the dangers involved at every step, Hendrik discusses the advantages of climb cutting and why it works. He demonstrates climb cutting methods both with a hand-held router and on a router table, always focusing on risk reduction. Ultimately, there must be a balance between risk and benefit. You’ll understand the concept of climb cutting and when you might use it after studying this chapter. The most important aspect of this router production is that Hendrik fully explains every procedure in real time. Most importantly, he doesn’t assume anything. Before demonstrating hand-held router techniques, he spends a great deal of time explaining the safety risks and the kinds of accuracy issues that might come up. He even discusses several common router injuries and why, in his professional opinion, they happen. Similarly, before launching into the various router table techniques, Hendrik deals with router table safety. He shows you where to put your hands and where not to. He shows you how to use push sticks, push pads and featherboards to increase both safety and accuracy. He explains what can go wrong and why it happens in order to give you a fuller understanding of why people get hurt with a router. Hendrik calls the router “the most dangerous machine in his workshop”, but through his explanations and demonstrations you will come away with a new respect for this amazing power tool. This machine is unparallelled in its versatility, but without proper training it should not be taken for granted. Hendrik is convinced that more people would be injured by routers than table saws if as many people owned routers – especially with router tables. Hendrik is known for his extremely long and detailed “bonus footage” sections in his instructional DVD courses and this DVD is no exception. The bonus footage is called “Template Routing”. Two chapters cover template routing both by hand and on the router table. In “Using and Tuning Your Bandsaw”, Hendrik shows you how to make router templates with bandsaw and sanding drum. But in this router production, he takes you through the steps required to use those templates to make curved furniture parts. You’ll appreciate the major emphasis he puts on safety throughout. As always, Hendrik’s DVD courses are not like the usual 45 to 60 minute production you may have found disappointing in the past. Hendrik takes you through every procedure in real time, ensuring that you fully understand the thinking behind every step. Most woodworking videos and television shows just show you the “gist” of each technique, editing away the finer details and problems that might arise. If you truly wish to elevate your router and router table techniques to a professional level, the details are everything. Normally, Hendrik can only cover all of the high-level details he loves to teach in person, but he has once again succeeded at giving you personal coaching in a DVD format. 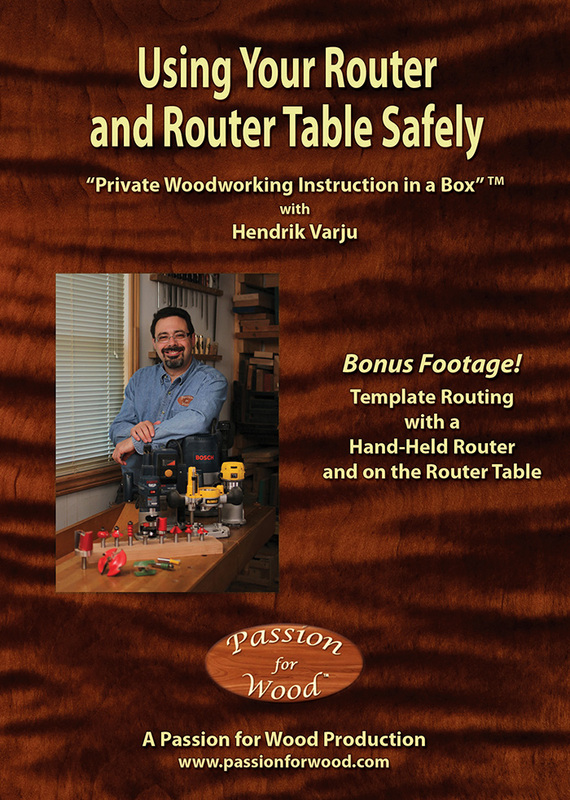 As a 4-DVD boxed set running for nearly 8 1/2 hours, “Using Your Router and Router Table Safely” will become the leading instructional woodworking DVD in this area. As the trademarked name says, this is “Private Woodworking Instruction in a Box” and nothing short of Hendrik’s in-shop seminars and courses even comes close.